The Carlisle Brass Andros Door Handle on Long Latch Plate Satin Chrome has a curved, modern lever and would be suitable for many different applications throughout your home. The backplate is also curved to compliment the lever style. This handle has a satin chrome finish. This handle is on a long latch plate. 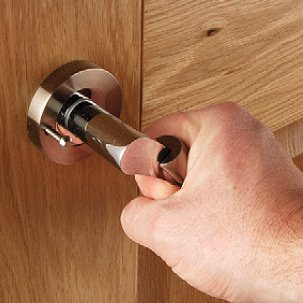 An appropriate mortice latch will be required for all non-locking internal doors. These are available separately; see Related Products and the Hinges, Locks & Latches category.